Synthetic peptide corresponding to Human LDH-C aa 221-233 (internal sequence). Previously labelled as Lactate Dehydrogenase C.
ab63966 is purified from goat serum by ammonium sulphate precipitation followed by antigen affinity chromatography using the immunizing peptide. Our Abpromise guarantee covers the use of ab63966 in the following tested applications. WB Use a concentration of 0.03 - 0.1 µg/ml. Detects a band of approximately 36 kDa (predicted molecular weight: 36 kDa). 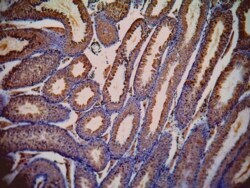 ab63966, at a dilution of 1 µg/ml, staining Lactate Dehydrogenase C / LDH-C in mouse testis section by Immunohistochemistry (Formalin/PFA-fixed paraffin-embedded sections). There are currently no Customer reviews or Questions for ab63966.